Galaga is old. It may well state 1988 on Galaga’s NES title screen, but that refers to its European and US release date, the Japanese Famicom conversion was released early in 1985 and they are all based on a port of Namco’s 1981 coin-op. This means that with any Wii U Virtual Console purchase you must consider if you already own numerous versions of this sci-fi game, and if you are new to this alien wave single-screen shoot-‘em-up, then it’s only fair to accommodate its technological shortcomings. Unless you go as far back as the early 1960s for Spacewar!, or Computer Space in 1971, you can draw a historical arcade line of space shooters from Taito’s Space Invaders in 1978, to Namco’s Galaxian in 1979, all linking to Galaga in 1981. It is a Namco classic, even without the fame of Taito’s T-shirt superstardom, and the NES received a solid conversion. However, the genre was usurped by the marvel of scrolling backgrounds, so a single-screen star field of enemy patterns may seem unsophisticated to a modern gamer. Even Galaga’s older Namco cousin, Xevious, scoffs at its wrinkles. Cheeky Konami NES cosmonauts, like Gradius and Life Force, call Galaga an old timer. There is a sense of perspective in acknowledging the seven year gap between the Japanese Famicom release of Galaga and Naxat Soft’s Summer Carnival '92 RECCA, which spans the entire life cycle of a modern console. 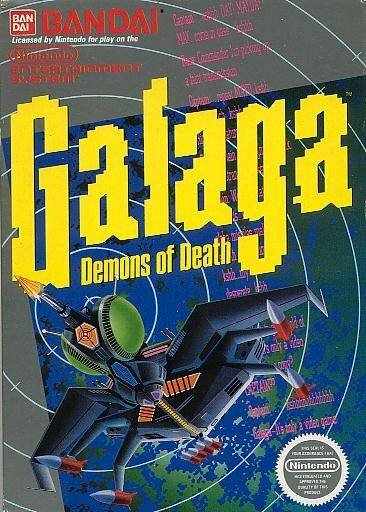 The American version of Galaga has a subtitle of Demons of Death, not to be confused with the duck of death in the movie Unforgiven, but there is little story beyond blasting every insect alien pattern in sight. 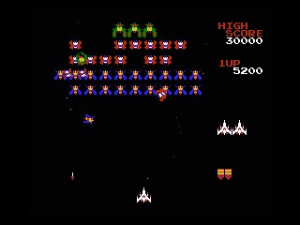 To an untrained eye Galaga closely resembles Space Invaders, but enemy attacks are more varied than a simple shuffling of left-to-right and alien designs are distinguished by true RGB colour, as opposed to a black-and-white screen with a coloured cellophane overlay. It is clear that Galaga shares much of its DNA with Galaxian, even if Namco’s Shigeru Yokoyama described them as different games during Galaga’s 30th birthday in 2011. Initially you are introduced to the flight patterns and formation of three winged alien insects. The two bottom rows are yellow wasp-like enemies with blue wings, these awkward hornet pests buzz and swoop to attack you from below, providing a stark gameplay contrast to an attack in Space Invaders. The middle two rows house white moth adversaries with red wings, and these combine with the hornets to dive bomb lethal kamikaze attacks, as well as weaving curtain fire, all at increased speeds depending on how far you are in the game. Most interesting of all are the game’s ‘Boss Galaga’ insects, not to be muddled with more conventional boss battles of later games like Galaga ‘88/’90, these four vermin per stage are intrinsic to the strategy you apply to surviving in Galaga. Each boss absorbs two hits before perishing, changing colour from green to blue and they can capture one of your three fighters using a tractor beam. However, you can retrieve the hostage if you time a shot while the boss is flying downward, although if you blast your red captured ship, or hit the boss while it’s sitting at the top of the formation, you will lose one of three precious lives. With no continues or credit system the risk is potent, but the reward of gaining a dual fighter for double firepower is tempting, even if two fighters present a larger target for enemy bullets. The core aim of the game is a classic chase to earn a top high score, and it feeds off each gamer’s desire to beat their personal best. Galaga has many intricacies in how it dishes out points, often based upon how faultlessly you dispose of a line or wave of enemies in a swift successive attack; for example if you destroy a clean alien streak you initially acquire 1000 points. New aliens are introduced as you progress further, such as the wasp-like hornets transforming into morphed insects and these sometimes appear in the game’s ‘challenging stages’, which are first introduced in the third and seventh stages. These are an early example of bonus areas, with 40 docile dancing enemies that build upon a score multiplier of 100 points. Therefore, if you miss one insect you receive a score of 3900, representing 39 thwarted defenceless aliens multiplied by 100, but if you blast all 40 waltzing enemies you secure a perfect special bonus of an invaluable 10,000 points. During the 1980s NES Galaga was perceived as a decent representation of the arcade game’s graphics and audio style, but a direct comparison to numerous versions of the coin-op on modern Nintendo systems highlights slight shortcomings in the NES game’s presentation. The NES sprites are chunkier, with simpler colouring that is not as bright, so they are not as well shaded, plus they are less detailed than the coin-op. This does not affect the addictive gameplay, if anything the plain NES hues are more striking to distinguish enemies, the basic star field is effective and firing on distinctive aliens makes them erupt in a firework of colours. The screen real estate has been altered, as the NES version now has high score, extra life and current stage information set in a frame on the right side of the screen. Therefore, the vertical arcade screen view has been adjusted to allow for the 4:3 television aspect ratio of the day; the panel compensates for this, but the distance between swarming bugs and the time you have to react from dive bomb attacks feels different. Most importantly the NES port is fast and smooth, with minimal sprite flicker, and European Wii U gamers conscious of full-screen and 60Hz Virtual Console issues receive the US version of the game. There is not any in-game blasting music, but the quick catchy ditty that introduces the opening stage is intact, as are the main gameplay sound effects like the dreaded screech of a kamikaze attack. Similarly, the short lived jingle for a perfect challenging stage bonus, and especially the jolly result screen tune, provide a snappy sound backdrop to hook you in for one more go. The NES audio is a close approximation of the arcade game, but the coin-op showcased a deeper boom for when your fighter exploded and a greater depth to its echoing space audio. The controls are as simple and accessible as left and right movement on the D-pad, combined with a single button to fire, mapped to either ‘A’ or ‘B’. Therefore, NES Galaga is just as playable on the original Wii Remote as more luxurious alternatives, although there is the convenience of continuing a game away from the TV using the Wii U GamePad screen. The focus on high score hunting encourages you to think like an ‘80s gamer, without an autofire or rapid fire option, you will develop different techniques to fire bullets at faster speeds. Your fighter shoots two bullets in quick succession, but timing is key as insects swoop down, so you may adopt unorthodox techniques, like laying your controller on a flat surface and bashing both and ‘A’ and ‘B’ simultaneously with two fingers for a brisker firing rate. 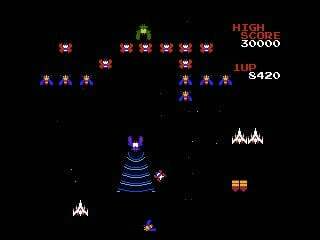 Galaga has become enshrined and rekindled in many forms over thirty years, and it has been referenced in popular culture from Tony Stark pointing out an agent procrastinating on Galaga in The Avengers film, to a lyric in a punk song by The Ataris. 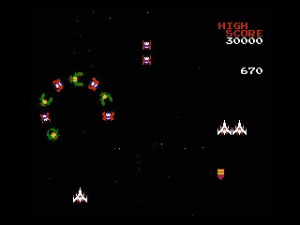 The main decision for gamers who are familiar with the game is to decide upon which version of Galaga to play; for example the original arcade game on the GameCube’s Namco Museum: 50th Anniversary has more options for setting the number of lives, difficulty and the value of bonus points. In contrast, this NES port only records one high score, so the onus is on the player to set their own targets, perhaps by aiming for a top score of 80,000 points as a starting objective. The NES conversion includes a two-player mode, where you have a controller each, but you take alternate turns after a fighter is lost, as Galaga is not a simultaneous two-player game. As you begin to chase your personal target, or other gamer’s scores, you gain more incentive to learn enemy behavioural patterns and intricacies, like how you obtain an extra fighter at specific score goals (your first 1-up is at 30,000 points, another arrives at 70,000 and then 140,000, continuing accordingly). A result screen displays your performance based on shots fired, number of hits and a hit-miss ratio, plus the Miiverse Galaga community is an alternative way to share and compete against other gamer’s high scores. If you are looking for a greater sense of value, it may be more astute to purchase Galaga as part of a compilation, as the original game is available on the Wii’s Namco Museum Megamix and the 3DS’ Pac-Man & Galaga Dimensions. 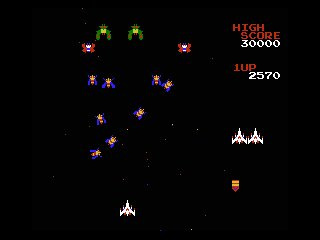 Considering that the 2013 Wii U Virtual Console release of NES Galaga is a 28 year old port of a 32 year old arcade game, it is quite possible that many gamers will already own a version of this shoot-‘em-up. 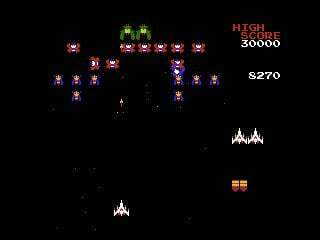 However, there is a compelling amount of single-screen bug repellent replay value if you approach Galaga with a target high score in mind, and allow it to wangle its insect-like hooks in you. Once you learn alien flight patterns, uncover the extra life scoring system, maximise challenging stage bonus points, and balance the dual fighter risk of granting a Boss Galaga to capture your ship, it rockets beyond the template of Space Invaders. As an addictive relic descending from gaming’s primeval wave of shooters, there is a historical context to Galaga that adds to the temptation of tackling the most retro of retro games. The only time I want a NES version of anything is when it is a game that is only on the NES or when it is no different either way. (Super Mario Bros 3 not bothered NES or All Stars are both fine). NES arcade conversions have never been something to interest me at all. (Compare e.g Lifeforce NES to TG16 Salamander). There is too many annoying things that the NES does. Such a shame Nintendo dont add online leaderboards to retro titles like this. Yes! Something to play at work! @Alienfish: You have a Wii U at work?? I just couldn't in any way shape or form pay $5 for this. This should be given free to Wii U owners just for having purchased a Wii U. Or one of those 30 cent promotions. I honestly wouldn't even pay 99c for it. I would pay 99c for Gyruss or Phoenix though. Ha! Hope everyone got the Avengers reference...if not, someone needs to watch that movie, apparently. I knew nothing about Galaga before I played it in the GBA compilation Namco Museum. It was my favorite port in the collection and arguably one of the biggest reasons why I ultimately became the gamer I am today. I'd probably wait to see if they ever do a sale on it or do a proper port of the arcade version instead. I think the miiverse community for old titles like this can restore that feeling of seeing a highscore list, but it's just not compelling enough for the current price. I snatched it up almost as soon as I found out. This was pretty much the only arcade game I played as a kid. At my old church there were two arcade cabinets, Pac Man (which never worked), and Galaga. It was rigged so you didn't have to use coins to play, and I spent hours playing it. @WingedFish Now THAT'S how you get kids to go to church. Great review; it really gets across why the game is still held in high regard by many gamers, despite the seemingly simple and aging gameplay. A game i really enjoy myself. The NES version is excellent, but, as you mentioned, anyone who also has a 3DS really should consider getting the Pacman & Galaga dimensions cart. Arcade Galaga, Pacman, and then Pacman CE, all with on-line leaderboards (that actually work). I have it on the Wii VC, and absolutely love it. I just keep going back to it, lol. I wish they would put Gaplus on there instead. It was so much better than Galaga and I have to agree with @rjejr Gyruss would be a welcome addition. There are only two machines that play it where I live and I hold the high score on both. I love this game, I really do but I don't see myself or many others buying these games for $5 a piece. Nintendo really has to think about their pricing for these games. I'd spend $3 at the most on this ROM for my Wii U. I mean, if Nintendo wants to charge a premium price for Earthbound compared to other SNES games then why not separate the premium NES games from these ones to a lower price. It just makes sense. Yeah, five bucks seems kinda steep. Not just for this game, though- Nintendo would make lots more money on these old games (at least from me!) if they were more reasonably priced. I'd have downloaded quite a few old NES titles for my 3ds if they were 2 or 3 bucks. sigh I would get this game but for $4.99? No thanks! This game should of been 30 cents as part of the digital promotion thing. Also, if anyone that bought this game for the original Wii should be able to download it on the Wii U for free or a VERY small price like 30-99 cents, etc. As someone else stated in the comments, it is a shame this game does not have online leaderboards. I bet more people would pick up this game if Nintendo would bother to actually add some type of online leaderboard or perhaps unlock music/gallery/etc. I just don;t understand! The Wii U virtual console could be so much better and yes I know earthbound is released but come on Nintendo, stop re-releasing games that were already released on the original Wii. If anything, I think ALL of the virtual console games from the Wii Ware Virtual Shop should be available on the Wii U Eshop right off the bat. That might be the longest review of Galaga I've ever seen. Cool game tho, still see it at the occasional pub. The NES versions of Galaga, Pac-Man, etc. are on Wii U because they are not on XstationOneFour3360iPhoneAndroidSteamPC. I agree with many of the frustrations from others about the Wii U VC service because it does have SO MUCH potential. But to seriously deter emulation Nintendo would be wise to price these releases more fairly and offer more of them per week than their usual one choice. Capcom seems to be the only other company aggressively putting out Wii U VC titles and classics from Konami are notably absent. Even a single entry from the Zelda franchise is absent. It is baffling why the Wii VC titles can't be dropped into some app at NOA and convert them instantly into Wii U VC versions. Games like Galaga and Vegas Stakes get slammed not because of the game itself but because of all the titles in N's library THIS is what they went for. It would have been very cool to see an N64 or Gamecube VC release by now, perhaps even 'Luigi's Mansion' to help celebrate the Year of Luigi. I love the VC idea, but the execution is fairly poor. Galaga may be "old" as the reviewer states, but without it, many games we know and love today would never have been possible without it's paramount success back in the day. A wonderful game, too! 10 out of 10 for me. I always loved this game as a child in the arcades, and I enjoy it today on my 3DS, my original NES cartridge of this very game variant and my Atari system. He thought we didn't notice...but we did. No, but it wouldn't be hard to do. Awesome game. I remember playing it in the PSX Namco Museum. I remember that line from The Avengers. Hilarious. Galaga is still an extremely enjoyable game. It is apparently still played and loved enough to earn a 7 on one of Nintendo Life's reviews. I still remember playing it and beating it eventually, it was a well-made space arcade game that takes time to beat with challenging bosses, a variety of enemies, and a multiplayer feature that makes this game just feel complete. Bravo, Namco. I have no idea why when I saw this I thought "hey I want that"